Regular soy sauce contains wheat and gluten, so if you need to follow a gluten-free diet, make sure you purchase gluten-free soy sauce for this recipe. This dish pairs well with our Asian Kale Slaw recipe. In a medium bowl, combine the soy sauce, vinegar, water, 1 tablespoon canola oil, crushed red pepper, and garlic. Add the pork chops and marinate them in refrigerator for 20 minutes or longer. Steam the broccoli for 5 minutes; until tender. Add 1/2 tablespoon canola oil to a large sauté pan over medium-high heat. Add the pork chops and sear for about 5 minutes per side or until done. (Reserve marinade for later). Place the marinade in a small saucepan. Bring it to a boil; reduce the heat and simmer about 2 minutes. Place the pork chops on serving platter and pour the cooked marinade over them. 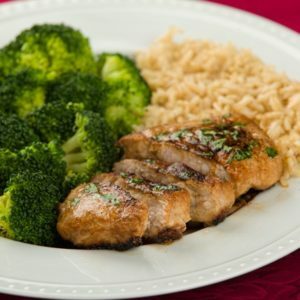 Top the pork chops with chopped cilantro and serve with the steamed broccoli.